Start down the path on that plan and revise as you learn. It may take a long time. It may not fully happen. You may find you are where you want to be sooner than you thought possible. If you have some sort of an itch that you’d rather be doing something else, you owe it to yourself to make a plan and try it out. For me, I cobbled together the most basic of plans to do something around blogging or productivity or something like that. It wasn’t refined and I honestly couldn’t articulate specifics when this whole thing started. I made this website as a start and began posting. A year later, I set that aside as the plan (something, something, blogging) because I’m not really a writer. I also found I don’t like the productivity stuff as much as the tools and tech that go into much of the productivity ecosystem. Along the way, I found that I do like software development and set out to learn as much as I could with the more specific plan of doing independent software development as a second career when I ran out of steam at my previous job. My last job was great in many respects but as I look back on this website, I spent a lot of time trying to become better at meetings, agendas, and email. I got to work with great people on some interesting consumer products that quite possibly you’ve used if you’ve washed your hair or clothes. I know way more about laundry than I ever thought I would. I was on the path toward retirement working this job and I had this refined plan for the future. As I continued to iterate on my plan, things came together in personal and professional life that led to me to finding the job I am at now. I really enjoy my day to day work. It is in the sprit of enjoyment that I suggest you make a plan for where you want to be in the future. You may learn a lot and end up right where you want to be. 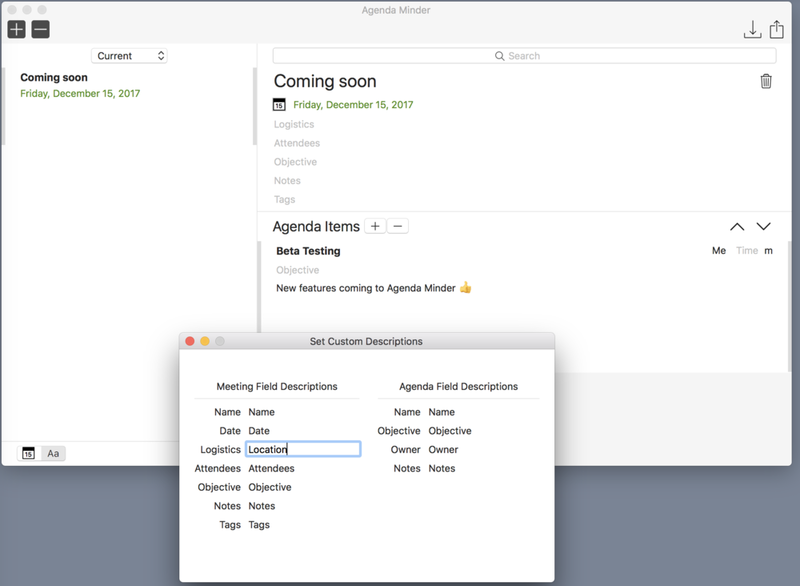 Update to Agenda Minder coming soon! I've redesigned and reworked my company website. Its written in the python Pyramid Webframework and deployed to a Digital Ocean VPS. I took the python for entrepreneurs at talkpython.fm to learn how to do it and can't recommend it enough. Apparent Software is having a 10 year anniversary sale (best wishes on 10 more!) meaning that Trickster is on sale for $4.99 which is a ridiculously low price. The app is a great value at $9.99. I wrote a blurb about Trickster previously. Go check it out and if you landed on my site because of filing, just go buy it!